Ah, it's that time of the year again. OverClocked ReMix’s second annual Grand Maverick Remix Battle is officially gearing up for launch! Just like last year, remixers from around the web will choose a Maverick from Mega Man X through Mega Man X8. From there, remixers will be pitted against each other and they have one week to compose a track using both their Maverick's themes. The following week, a public vote will be held to determine who has the better mix. The winner will move up the brackets (two brackets competing on alternate weeks), and the process continues until there is only one theme left... the champion! If you'd like to participate, you have two weeks sign up before things start cooking up. And if you're not a remixer by any means, the tournament is always looking for help in the art department. Banners, signatures, illustrations, and so on. The visual motif for this particular competition isn't set in stone, so don't get too invested in that just yet. For full details, rules, voting, and more, check out the complete post in the OC ReMix forums here. Good luck out there! I'd like to note that, unlike the regular OCR featured albums, the quality ratio for these are usually about 95%. So, even if you've been let down by too many techno tracks or similar in the main OCR featured albums, still check this one out. PS: I always thought of the GMRB as a DarkeSword thing, and he just happens to use the OCR forum to post. I could be wrong. I have to say, if the bonus content for the Mega Man X OC ReMix album was any indication, this is one of those things that's best ignored. Sure, some of those remixes were okay. Even good. But a majority of them were just uninspired and repetitive. 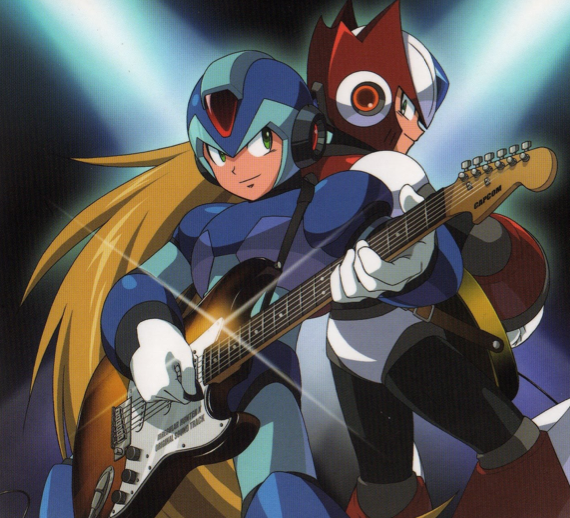 "I have to say, if the bonus content for the Mega Man X OC ReMix album was any indication"
They are not. Just in case you missed it the first time I said it. It's a competition and they only get a week to do stuff, so there's bound to be some bad apples. But I've enjoyed every Grand Robot Master and Grand Maverick competition they held. Sure, the techno/trance/dance whatever tracks can get whishy washy, but there are a few tracks that are arranged and composed very nicely, whether it be trance, rock, drum and bass. I know people have different tastes in music and tend to viciously hate a genre, but good music is good music. Take Zircon's 'Tornadoman Goes Clubbing'(Metalman vs. Tornadoman) https://www.youtube.com/watch?v=HEEKcsR05I4 I think it's a very good remix and I can picture it on the dance floor. Txai's 'Armored Beetle' (Armored Armadillio vs. Gravity Beetle) http://youtu.be/iizV0gWIR4o is one of my favorites from the last Grand Maverick competition. I'm just hoping there's more X4-X8 entries not counting X vs Zero....Seems like they always get glazed over. X7 and X8's soundtracks deserve some love.